Former Beatle Paul McCartney has sent a letter to the leader of Poland’s third largest political grouping asking for help in turning November 21st into a day of honour for Nobel-winning writer Isaac Bashevis Singer. In his letter to former punk-rocker Paweł Kukiz, now head of the Kukiz’15 political group, Macca said he wanted Poland to recognise Singer’s birthday by turning it into a national day of recognition for the Polish-born Yiddish language writer because of his support for animal rights. The 76-year-old Liverpudlian began his letter by congratulating Kukiz on the 100th anniversary of Poland regaining its independence. He mentioned that he will be coming to Kraków for a concert soon (December 3) and appealed for the Polish politician and rocker’s help. “To bring [Singer’s] message of compassion to a new generation of Poles, would you help officially proclaim his birthday, 21 November, to be Isaac Bashevis Singer Day?,” the Hey Jude singer said in his letter. 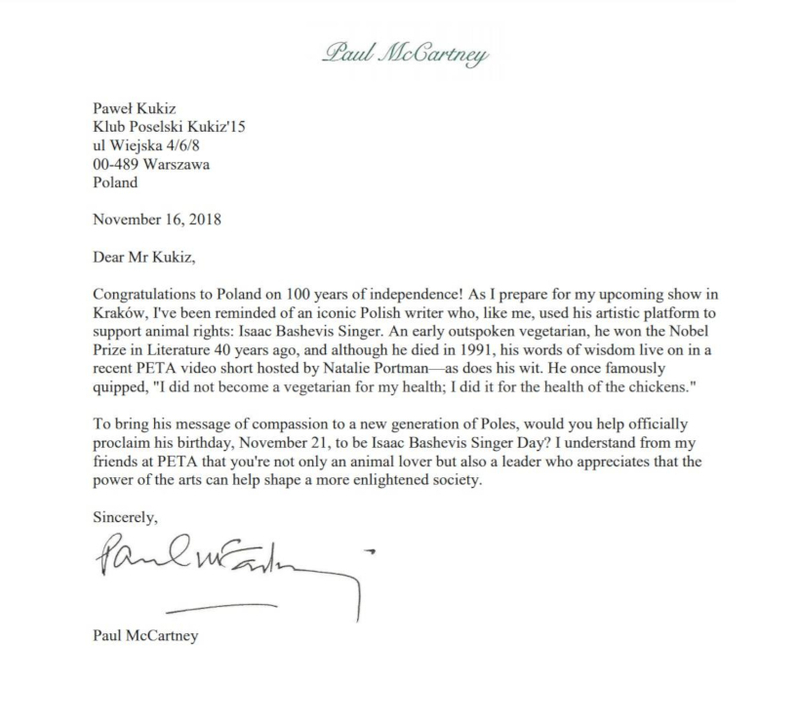 McCartney likened himself in the letter to the vegetarian Bashevis Singer saying that Bashevis Singer “like me, used his artistic platform to support animal rights.” The former Wings frontman revealed in his letter that he had heard from friends of his from the radical animal rights group PETA that Kukiz is an animal lover. The Kukiz’15 leader could barely contain his excitement upon receiving the letter, which he announced on Friday on his Facebook page: "Never in my wildest imagination did I ever think that in my life there will be such a moment that I would receive a letter from Paul McCartney, who ... asked me for a favour! "And he even sent us all his best wishes for 100 years of regaining our independence!!! Thank you!” he enthused. Kukiz declared that he would “do everything to fulfil Paul McCartney's request”. He later announced that he would respond to McCartney's letter by action. “We are submitting a draft resolution on Monday,” he informed. 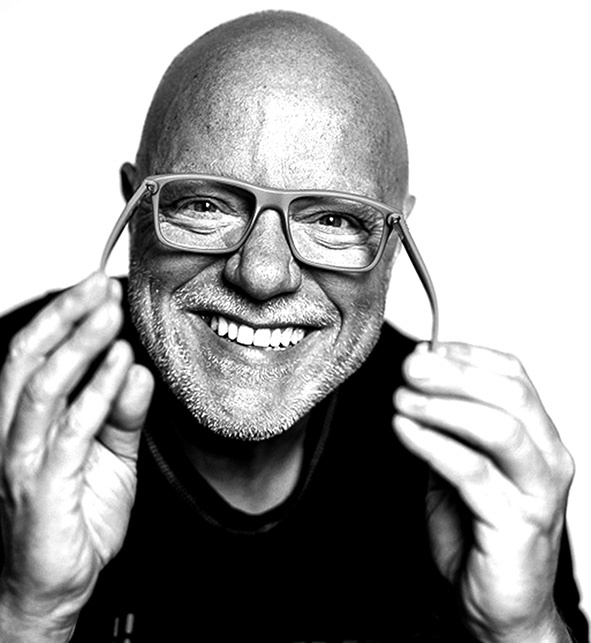 “I hope that on November 21 in the Sejm there will be a resolution commemorating the anniversary of Singer's birth, and in the future a petition will be sent on the basis of this resolution by, for example, a parliamentary group, to make this day Singer's day,” he said. He added that he and his wife are huge fans of Singer's work, and posting a set of photos showing shelves groaning under the weight of many volumes of the writer’s works, said his home library is full of books by this author. Isaac Bashevis Singer was a Polish and American Jewish writer who wrote mainly in Yiddish who won the Nobel prize for literature in 1978. Singer with the help of his brother emigrated to the United States in 1935 due to his difficult financial situation and the growing anti-Semitism in Europe. He died at the age of 88. At the time of publication, no draft legislation or resolution had been submitted in the Polish parliament and Kukiz’15 had not responded to requests for comment.